Another year gone, so I suppose it's time for an update on the bet. The NCDC data seems to have moved again, I think this is the current version. 2014 is presumably provisional but unlikely to change much, and it seems timely to produce this post now rather than wait for some future updates. Oh, since I'm writing, Happy New Year. Interesting - I hadn't heard about this. They must be nuts; even money on temperatures dropping? 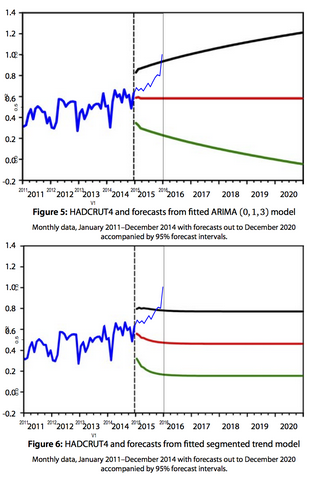 Are there any equivalent bets about the "Hiatus" - something like, The trend for the next ten years will be less than ___ (put in half the trend of the ensemble mean of the climate models)? I imagine Judith Curry might take that, assuming she has some money to risk. Any word from your other side recently? Do they still exist Are they likely to honour their side? Hmm, yeah, they'd better be hoping for a big tropical volcano, but even that might not be enough to save their butts. Several, maybe. The sun sure won't be. So now forewarned (I typed forewarmed at first :)), it's time for those Russians to start saving up. Although, the next few years could prove to be a bit difficult in that regard. MikeR, half the trend isn't a hiatus, it's just a slow-down. Terminology aside, I doubt Judy has that much confidence. >"in order to lose temperatures would have to drop to values not seen since 2000"
This has happened 5 times in last 130 comparisons. I would expect it to be less likely than 5/130 because the energy imbalance keeps growing and is larger now than in much of that period. Last time it occurred was 1966. Pinatubo max fall comparing adjacent 3 year periods was 0.72. So volcano or something else having double the effect of Pinatubo doesn't seem guaranteed to be sufficient. OTOH something just a little bigger than Pinatubo and some luck with for example timing of that event and a major la nina may still be enough. Every month that passes must surely increase the size of the volcano needed. Judging you to be over 95% likely to win does not seem difficult. BTW are the last two blue lines long enough? It looks like there is a one year gap between them suggesting they are too short. "MikeR, half the trend isn't a hiatus, it's just a slow-down." Why does it need to be a hiatus? 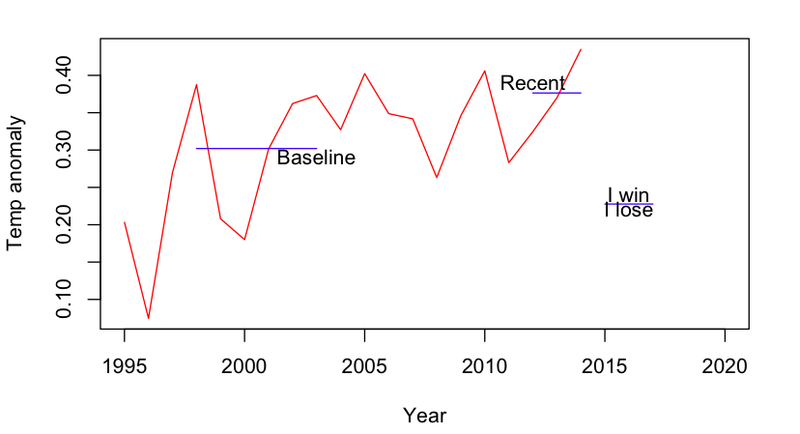 Those who believe in lower climate sensitivities (say, Nic Lewis) expect a lower trend, even when the "hiatus" ends. Half the expected trend seemed like a good place to bet, especially if someone from the "long-term paleo says ECS=3, QED" school expects the global temperature to jump way up soon to make up for lost time. I would think it more interesting to bet with a "lukewarmer" than with people who are well off on the fringe, like those who believe that solar influence explains everything. "Terminology aside, I doubt Judy has that much confidence." Well, that's easy for you to say, since it doesn't cost you money, and you can "claim victory" if she doesn't have spare cash on hand to bet. But would you be willing to take my bet with her if she did? I very much doubt she's certain, but she might possibly think it's more than 50-50 that the "hiatus" continues for another decade; she goes around predicting it. I don't bet, for that matter I've even sworn off the cost-free annual Arctic sea ice minimum guessing game, but maybe James would like to make her an offer. I'd be quite shocked if she bit. In any case, it wouldn't likely be for lack of funds given her extracurricular activities. Either 1) The people you are betting are crazy. Or 2) $10,000 isn't much money to them. >"Eric said... There are only two possible conclusions here:"
Of course you shouldn't look at current conditions to decide whether their decision to take the bet was crazy but what they thought and the situation at the time the bet was made. "two solar physicists who argue that global temperatures are driven by changes in the Sun's activity and will fall over the next decade." oh ... that is next decade from August 2005 at the latest. oops. Not had any email exchanges with the other side for a few years. Should look them up. Chris, yes the plot was just based on annual av so the line 2015-17 is 2 units long etc. Sloppy perhaps but good enough for me! MikeR, I would probably be on the low side of a bet versus many scientists who have argued (at least implicitly) for an acceleration in future warming. "MikeR, I would probably be on the low side of a bet..." That is kind of a neat idea. But I think that half the projected trend would be too low for you, isn't that right? Since I think the climate sensitivity is very important, I would think it was awesome if climate scientists would start making bets about it, instead of fighting with the "no warming" types. "maybe James would like to make her an offer. I'd be quite shocked if she bit." Steve Bloom, why would you be shocked? Are you quite sure that she doesn't believe what she says, because _who could_, you know? She seems serious to me. Especially as James seems to think he might take her side of the bet. Oh, dear. You have collateral? though that is published 2004 so no guarantee it is still valid. Andrewt, I suspect that CV could be his son, based on previous email exchanges. Anyway, there is no desperate need for contact right now. You need to work on your cynicism, MikeR. BTW, it's possible to simultaneously think there will be an acceleration and take the low side of a relatively short-term bet. NCDC have now produced Nov data and at 0.432 it is marginally below the average to Oct so hardly affects the average. The annual figure provided appears to be a simple average of the 10 (or now 11) months data they have for the year so far. have Nov at +0.24 and Dec at +0.31 so it seems likely that the 2014 figure will be higher than the one you used. I agree that the odds are that you will win your bet. I personally would not have entered into such a bet, though I believe that CO2 increases in the range that we have experienced have a minor effect on global temperature. If I understand it correctly, you have been active the effort to determine the temperature/co2 relationship by mathematical model. Out of curiosity, what would the change in temperature over the period of the bet be according to your model? I've always argued that the most robust and reasonable estimate is basically a continuation of the recent linear trend. Of course there's a bit of uncertainty due to internal variability, also room for debate over what historical period for the trend! But overall, around 0.15C/decade is a reasonable estimate. I think recent obs are a little below this, but not much. The year 2014 was the warmest year across global land and ocean surfaces since records began in 1880. The annually-averaged temperature was 0.69°C (1.24°F) above the 20th century average of 13.9°C (57.0°F), easily breaking the previous records of 2005 and 2010 by 0.04°C (0.07°F). "Cryosphere Today Arctic sea ice area < 1 million square kilometers by the summer of 2022 at the latest?"